On April 6, Hayes opened the show with a run of eight songs from the new album. After playing “If May Be So Bold” and “Things You Don’t Want to Know,” he commented on the half-seated/half standing setup in the venue. “This is like America today,” he said. He mused about a club in Atlanta that has seating in the middle and standing room on the sides, which he compared to a mullet. “This is more of a bipolar situation,” he concluded. 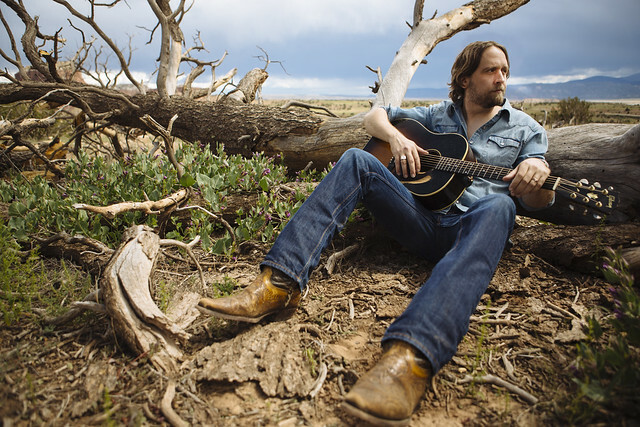 Read our Parklife DC review of Hayes Carll at City Winery on Aug. 4, 2018. Hayes and his band continued by playing “None’ya,” co-written with his partner, Allison Moorer. (We covered Allison’s older sister, Shelby Lynne, last July.) They followed that with “Be There” and “Beautiful Thing.” Before the next song, “Fragile Men,” co-written with Lolo, Hayes spoke about confronting figures in public spaces, addressing a recent situation with right-wing figure and conspiracy theorist Alex Jones at a bar in Austin. Jones, who felt harassed, started filming the confrontation on his phone, and the other bar patrons just laughed at him; one laughed so hard as to fall over. Hayes suggested the best way to handle these suggestions is laughter. “Jesus and Elvis,” the last song from the initial run from the new record, described a bar in Austin called Lala’s Little Nugget, founded in 1972. Despite being founded in 1972, Hayes said that the place has nothing in it from after 1968. It’s also known for hanging Christmas lights all year. The band took a break, and Hayes played “Beaumont,” from his 2008 album, Trouble in Mind. He said that he was afraid he might have over-romanticized the East Texas city located about 25 minutes from the Louisiana state line, because he met people at his European shows who were planning vacations there. “Beaumont is fine,” he said, “I just wouldn’t vacation there.” In Beaumont, Hayes has played at Courville, which hosts a gun raffle before the shows. Noted Americana singer-songwriter Darrell Scott co-wrote “The Magic Kid” with Hayes for his 2016 album, Lovers and Leavers. Hayes’s son, a magician (in the sleight-of-hand-sense, not the SyFy series sense, sadly), recently joined the Austin Association of Musicians, which meets the first Monday of every month in an IHOP. Hayes shared that his son was supposed to fly in to DC and spend a few days with him exploring the city, but he wasn’t able to make it. The band returned and played “Chances Are” — released on KMAG YOYO, and Lee Ann Womack later recorded it on her 2014 album, The Way I’m Livin’. In 2016, Hayes receiving a Grammy nomination for Best Country Song for the song. Ruston Kelly, who opened for Patty Griffin last Wednesday, co-wrote “Love Is So Easy” with Hayes for Lovers & Leavers. On Trouble in Mind, outlaw legend Ray Wylie Hubbard (who we covered last July) took Hayes under his wing, and they co-wrote “Drunken Poet’s Dream.” Hayes shared that Ray Wylie was on an animals kick, and they co-wrote a song called “Chickens.” This paid off when a wealthy patron who gave him a $100 tip and bought rounds one night turned out to be Don Tyson of Tyson Chicken, and Hayes got the song in a commercial. Read our Parklife DC review of Ray Wylie Hubbard at City Winery on July 21, 2018. Hayes and the band played the title cut of What It Is, followed by Winnipeg, Manitoba songwriter Scott Nolan’s “Bad Liver and a Broken Heart.” They finished their set with two songs with KMAG YOYO, “Hard Out Here” and “Stomp & Holler.” After hearty round of applause, the band came back to play “I Will Stay” from the current album, “Wild as a Turkey,” from Trouble in Mind, and “I Wish I Hadn’t Stayed So Long,” the lead-off track from the 2005 album. Raucous applause accompanied them again as the evening ended.